As hundreds of survivors struggle to recover emotionally and physically from the Oct. 1 attack, they are beginning to come to terms with the financial toll of the violence perpetrated against them. Even those who are insured could face untold costs in a city they were only visiting. "We really don't have a good handle on the intangible costs of something like this ... the ripple effects on family and friends and neighborhoods when a large number of people have been shot," Wintemute said. More than 100,000 people are shot every year in the U.S., according to the Centers for Disease Control and Prevention. That generates about $2.8 billion per year in emergency room and inpatient charges alone, according to a recent study in Health Affairs. The average emergency room bill for an individual gunshot victim is $5,254 and the average inpatient charge is $95,887, according to the study. The U.S. senators representing Nevada, Dean Heller and Catherine Cortez Masto, wrote a letter to America's Health Insurance Plans, an industry trade group, and Scott Serota, CEO of the Blue Cross Blue Shield Association, requesting help with out-of-network bills, copayments and deductibles for the Las Vegas shooting victims. Many of the people who were shot had traveled from other states, including California, Iowa and Tennessee. California and some states protect consumers from such bills, but Nevada is not one of them, said Sabrina Corlette, a research professor at Georgetown University's Center on Health Insurance Reforms. But Corlette said most insurers allow patients to request exceptions based on the circumstances. "In this situation, I imagine most insurers are going to want to be compassionate and work something out," she said. The victims and their families aren't the only ones who will be affected financially by the mass shooting. 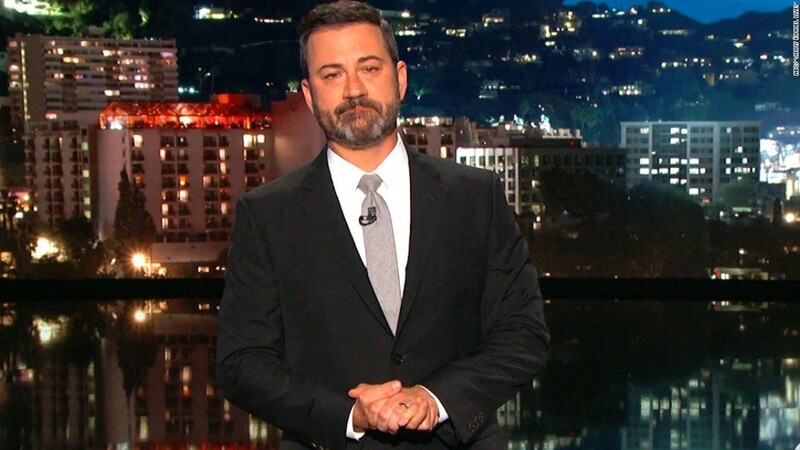 Taxpayers, too, pick up much of the tab for the health care costs associated with gun violence because many patients are covered by Medicaid and Medicare, two government insurance programs. And hospitals will also be on the hook for some of the care for patients who don't have insurance. Hospitals in Las Vegas quickly mobilized to treat the hundreds of victims who were streaming in that night, and they don't know yet how much of the care will be reimbursed. At Sunrise Hospital & Medical Center, staff treated more than 200 patients. Sunrise plans to file insurance claims and will "be extremely sensitive to the financial status" of patients when considering their out-of-pocket portions, a spokeswoman said. GoFundMe accounts, like this one for Tina Frost, have been helping victims and their families get by. Valley Hospital Medical Center is encouraging patients to complete paperwork for a state program called Nevada Victims of Violent Crime, which would pay their balances. And Dignity Health's St. Rose Dominican said it will bill insurers and accept donations but will not require payment from victims. California victims can also get help with medical expenses and income loss from the California Victim Compensation Board. In addition, a GoFundMe account started by a Clark County commissioner has raised $11 million thus far. And many survivors have individual GoFundMe accounts. Fowler's GoFundMe page has raised about $39,000. Fowler said he doesn't have disability insurance so he will rely on the funds to help cover his expenses while he is recovering and missing work. Michael Caster, 41, who lives in Indio, California, has a GoFundMe account that has raised about $26,000 so far. 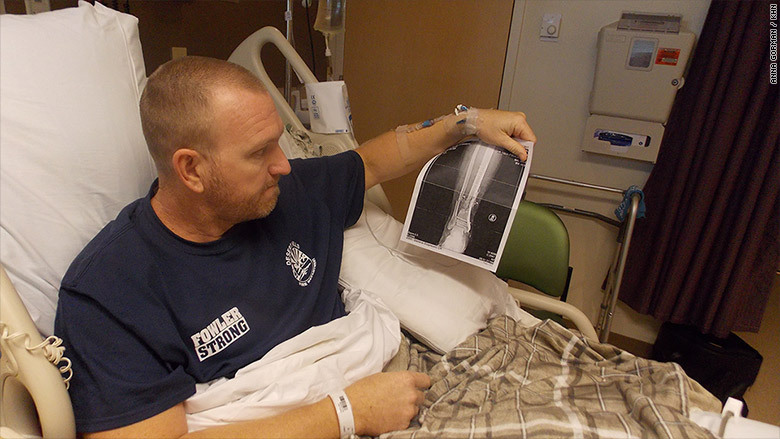 He's paralyzed from the waist down after a bullet lodged in his spine. At Sunrise Hospital, doctors drained the blood from Caster's lungs and removed some of the bullet fragments. Sitting in a hospital bed 11 days after the shooting, Caster said he didn't know how much of his care would be covered by his health insurance. He works in human resources at a California hospital and has a job-sponsored policy with Anthem Blue Cross. "I've never really dealt with injury," he said. "I don't want to be stuck with a bunch of bills." His bills could rise further: That day, he was scheduled to be flown to a rehabilitation center in Colorado for people with spinal cord injuries. 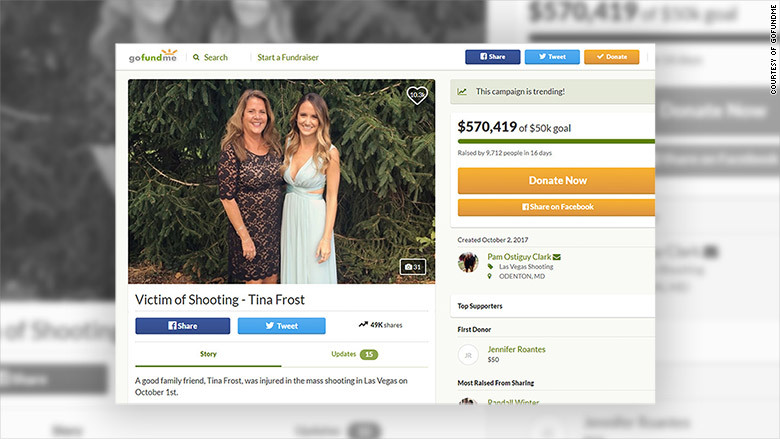 Mary Moreland, whose daughter Tina Frost was shot during the country music festival, said that at first she didn't understand why so many families were setting up fundraisers. Then, the severe financial strain the shooting would take started to dawn on her. Now, Moreland said she's grateful for the nearly $580,000 raised through GoFundMe. Frost, a resident of San Diego, had emergency brain surgery the night of the shooting. A bullet had pierced her eye and exploded in her brain. As she lay in ICU earlier this month, her mother said small improvements were major milestones. "Today she squeezed my hands," Moreland said. The next night, Frost came out of a medically induced coma and was later flown to Johns Hopkins Hospital in Baltimore, near her mother's home. Over the next weeks and months, she will need multiple operations and a slew of specialists, including neurosurgeons, plastic surgeons, occupational therapists and mental health counselors. Moreland said she cannot even begin to imagine what her daughter's care will cost. Frost has Blue Cross insurance through her job at Ernst & Young in San Diego, but Moreland said she doesn't know what the deductible and copayments are. "Being realistic, knowing what I know about costs of health care, it's scary," Moreland said. "But she's alive. She's not one of the 58 other people."